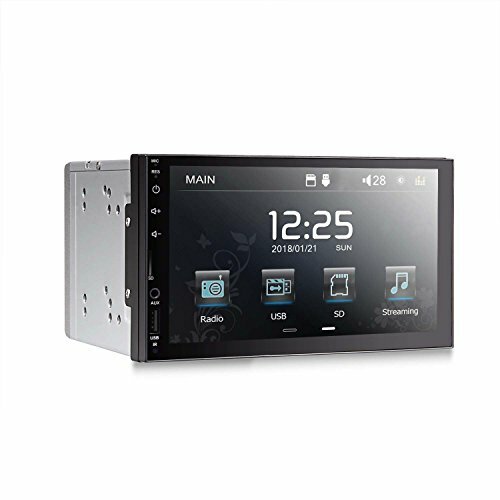 Standard double DIN size for most car and truck (Head unit only working on DC12V, truck must have power adapter for 12V power supply). Others need Dash Mount Kit for perfectly matched. You can contact our service for recommendation. --Support audio format: MP3,WMA, OGG, WAV, RA, AC3, MP2, FLAC, APE, AMR etc. Video format: AVI, MP4, MP5, FLV, RM, RMVB, MPG, VOB, DIVX, etc. Picturs Format: BMP, JPG, JPEG, PNG etc. 24 Hours Clock and Date. Mirror Link for Android Cell Phone. Universal Auto Stereo Install Kit Including. Backup Rear View Camera DO NOT Include, You Can Buy ASIN B07D3S7BMX or B07D3S7STZ. The car stereo is for Nissan:Tiida(2004-2010),Qashqi(2007-2010),Sunny(2005-2007),X-Trail(2001-2011),Paladin(2005-2011),etc. For Hyundai: Elantra(2000-2006),Avante XD(2000-2006),Sonata(1999-2007),Sonata Gold(2001-2005),Sonta V6(2001-2005),NEW EF Sonata(2011-2005),etc. For other car:Cr-v 2003,Passat B5,etc.